This is another custom build that I recently completed. It’s a 2 in 1 pedal, with two Tesla Cannon circuits running with Master + A/B switching. The two Tesla Cannon circuits (based on the classic Big Muff) were tuned slightly differently; one slightly ‘hotter’ than the other for higher gain. I used BC184 transistors (hand selected for the right gain) for the lower gain rhythm channel, and 2N5088 transistors for the higher gain lead channel (again hand selected). The higher gain circuit is more suited to lead playing and the lower gain circuit more suited to rhythm etc. work. Both channels are very flexible though and can be used for a multitude of tasks; the mids knob really helps in this regard. The pedal was hand painted at the request of the customer. I have not done this for a while (I usually use decals/labels), but I was pretty happy with the end results. I should get the old paint brush out more often! It sounded great when testing, and the Master + A/B switching that the customer requested was a good idea as it allows you to go from clean, to rhythm to lead very easily. If you are interested in a build similar to this just send me an email and I will get back to you ASAP. Hope you like the pics, but no ‘gut-shots’ for this one unfortunately, as I was so eager to ship the pedal I forgot to take any! 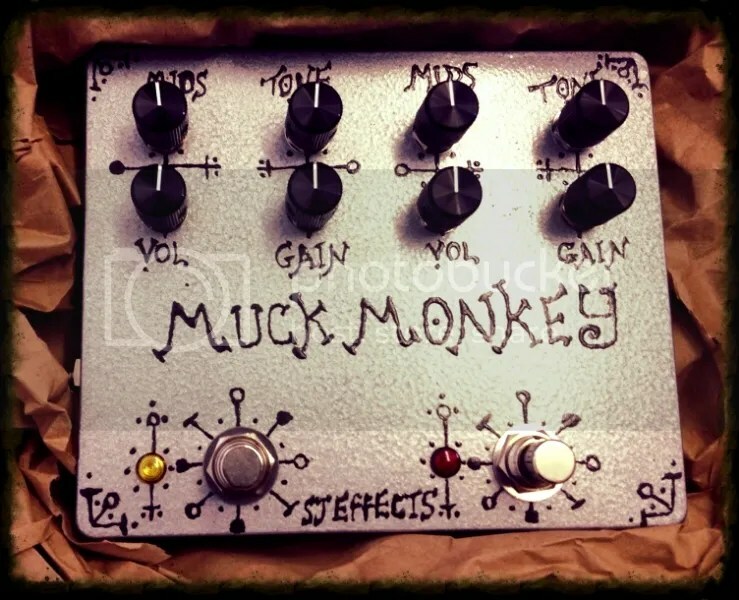 Muck Monkey 2 in 1 Pedal. Muck Monkey 2 in 1. The picture also shows the ‘case candy’ I ship with each pedal. The envelope includes (brand new) SJ Effects Picks, Manual, stickers etc, rubber feet etc. 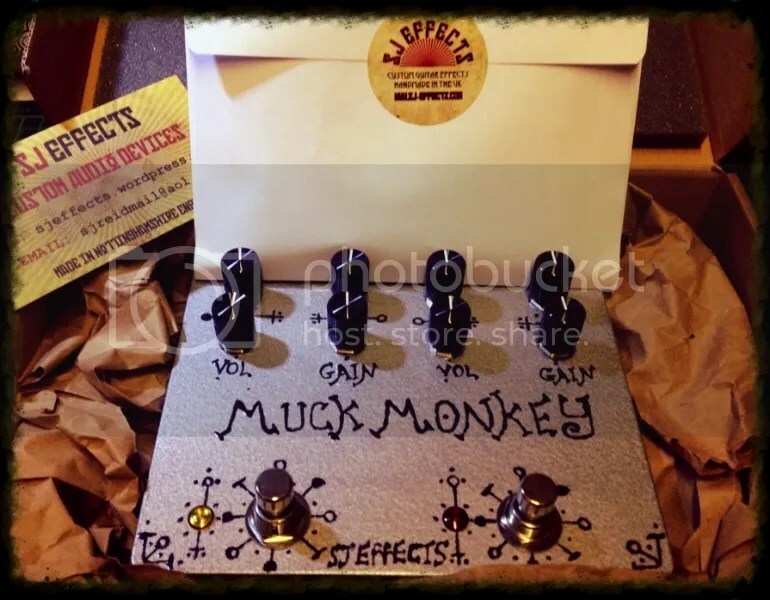 This entry was posted in Uncategorized and tagged big muff, big muff mids, big muff mids switch, custom effects, custom fuzz pedal, custom fx, custom guitar effects, custom guitar pedals, fuzz pedal by sjeffects. Bookmark the permalink.